Hello Made From Pinterest fans! I’m Jen and I blog at Bakerette.com where I share daily recipes, gardening tidbits, and a smattering of DIY projects. I’m excited to be guest posting this month for the three sisters! I met Debbie several years ago at a bloggers’ lunch and we connected instantly. She’s very down-to-earth, so easy to talk to, and a delight to be around. And since then, I’ve become acquainted with Sherri and Tracy. They are ALL amazing women. 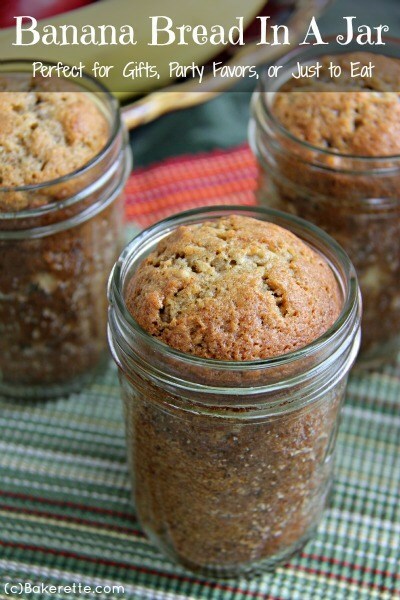 Banana bread made in a jar. Wuh??? Pretty darn crazy, huh? 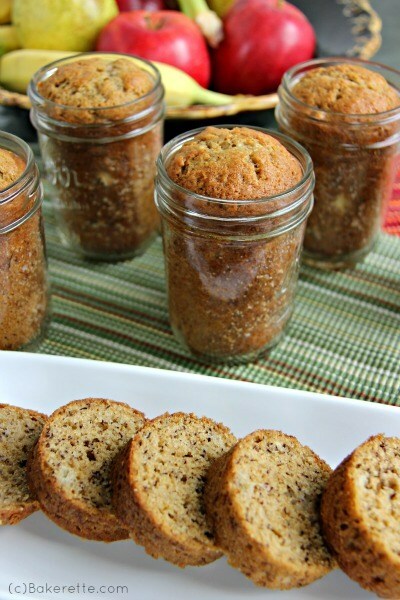 Why would anyone want to make banana bread in a mason jar? Well, for a couple of reasons: I love making these beauties as gifts. I can make a bunch at a time and send them over to neighbors as a nice gesture, pass them out as party favors, give them as gifts at Christmas, as teacher gifts, or store in my pantry. If sealed properly, they can keep for a few months in the freezer! Think food storage people! You can decorate the jars with a circle of batting and fun fabric under the jar ring and add a pretty label. So darn cute! And guess what? They slide out so easily! Just give them a slight shake and out they come. Preheat oven to 325 degrees F. Prepare the mason jars by greasing the insides of the jars with cooking spray. In a large mixing bowl, beat together the shortening and sugar with an electric mixer until well incorporated. 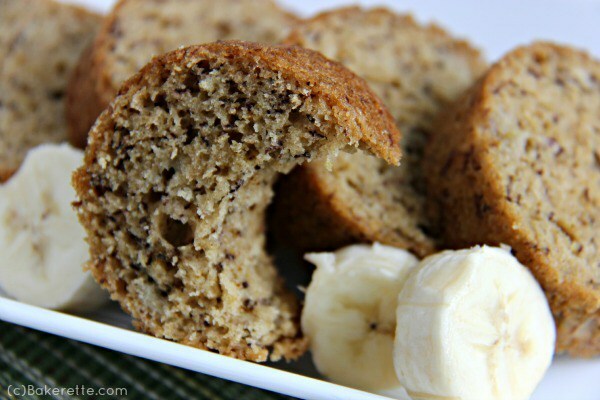 Beat in the eggs, bananas, and water until light and fluffy. In a separate bowl, sift together the flour, baking powder, baking soda, salt, cinnamon and cloves and pour into the banana mixture a little at a time mixing well with each addition. Fold in pecans. Spoon batter into mason jars filling 1/2 way full. Wipe off any spills on the jars before baking. Do not add the lids. Tip: You can also pour the batter in a gallon-size bag with a hole cut in the corner and pipe the batter into the jars. Line the jars on a baking sheet and bake for 40-45 minutes of until a toothpick inserted in the center comes out clean. Note: You can also line the jars up in the oven without the baking sheet. Some people have mentioned they cook more evenly that way. You might want to experiment. I’ve never had a problem.) Meanwhile, sterilize the lids and rings in boiling water. Remove the jars from the oven and screw on the lids and rings to the jars while the bread is cooling. The jars will seal as the bread cools down. You will hear a light “ping” when the jar seals itself. If you don’t, press down on the lid to see if it is firm. If it doesn’t “give”, it is sealed. Also, if the bread bakes above the rim of the jar, no worries. Just gently press the top of the bread down with the lid and seal. Store in the refrigerator for up to a week or eat when cooled! Can also be stored in the freezer for a few months. Note: You can forgo making this bread in the jars and bake it in two 9 x 5-inch bread pans for 55-60 minutes or until a toothpick inserted in the center of the bread comes out clean. Thank you, Debbie, Sherri and Tracy, for allowing me to guest post today! And I would love it if you stopped by Bakerette.com for a bite to eat! You can also find me on Pinterest, Facebook, Instagram, Google+, and Stumble Upon. I hope to see you around! Thanks Jeni for a great recipe and a super cute idea!